Sutradhar group’s Oleanna gripped the city audience, forcing them to look deep within and question the rights and wrongs of human desires. With inquisitive eyes set on the curtains that were about to rise, the audience eagerly waited for the show to begin. They were ready to witness the story of Oleanna, a play performed by Sutradhar theatre group on Wednesday at Ravindra Bharathi. Oleanna, directed by Prof. Bhasker Shewalkar, is based on an original play of the same name penned by American playwright David Mamet. Comprising only two characters, it is showcases the power struggle between a university professor and a female student, who accuses him of sexual exploitation and, by doing so, spoils his chances of being accorded tenure. As the auditorium slowly came alive with its spotlights focused on the stage, the tension amongst the two characters seemed palpable. The intense discussion between the professor and his student, about the education system on the whole, has been aptly conveyed by Vinay Varma and Supriya Aysola, who donned the roles of the professor and the student respectively. The two performers proved their prowess by stressing on words aptly, taking justified pauses, emoting beautifully and using suitable body language. In fact, their craft made it all seem so real, especially in the first half, that the audience became the third character in the story. Following the first half, a five-minute break came at an opportune time, giving the audience a moment to catch their breath and analyse what was happening. Questions on whether the professor was wrong in saying he likes his student, or if the student was wrong because she stayed back when the professor promised to give her an A if she visited his office ‘alone’, bothered everyone. The audience was in a dilemma about whom to support in the academic power play. 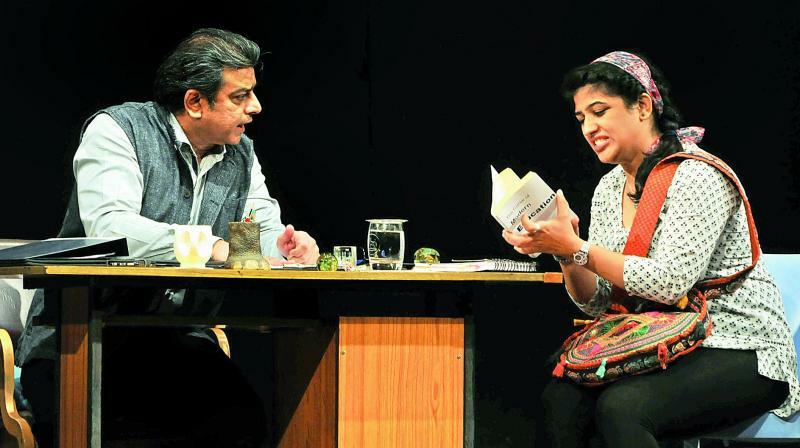 In the second half, Supriya’s character, the exploited student, showcases her vulnerability after being wronged, whereas Vinay captured the audience’s attention with his perfect dialogue delivery as the self-righteous professor. The chemistry between the two performers was truly the heart of the play. The actors also utilised the stage effectively. Interestingly, in this two-character play, another element that played the perfect emotional catalyst for viewers was the phone, which rang at appropriate moments, bringing about short-lived, yet much needed, moments of comic relief. Or, is everything fair in the 21st century?